Whenever I brag and rave about Bristol, I tend to mention the festivals that are such a huge part of life here. Sometimes there’s one every weekend, I say and what I really mean is that they’re all the same, pick one and go to it and you’ll find the same stands, the same crafts, the same people wandering in and then leaving again. Some charge and some don’t and occasionally that seems to be the biggest difference. With this thought in mind, there wasn’t much surprise when reading about the Love Cooking Festival although its location at Colston Hall was an interesting twist. However, who would want to go see people cooking on stage at around £20 a ticket? A visit seemed to be a good idea. Richard Allen was the first chef I saw and she was announced on stage by Nigel Barden, the food and drink presenter for BBC London TV, Radio and Online. Nigel did not just do the presenting and introductions but stayed on to help Rachel with the banter and consistency. She had been up since 2.30am to make her way to Bristol and my heart sank a little at the potential half-hearted performance. The show proceeded at a steady pace and Nigel filled in with chat for about half of it. Rachel cooked a three course menu of Scallops with Brussel Sprouts, Bacon and Orange; Roast Duck Legs; Lentils with Red Wine and a Treacle Tart. Her commentary was consistent, her manner professional and by the end I thought I would try out the recipe. I couldn’t help but be distracted throughout the session, however, with crying babies, half empty rows of seats – it was held at 2pm – and general thoughts of ‘this would be just as good on TV’. All the slight detachment disappeared when Ainsley came out to play. Ainsley Harriot was on between 4 and 5pm and he was magical. A well seasoned TV presenter who has hosted various TV shows and food specials and is probably best known to daytime viewers as the host of Ready, Steady, Cook for 20 seasons. His ease and charm with everyone in the room meant that Nigel’s role quickly became redundant as he sat back and also enjoyed the show. Ainsley danced and cooked and sweated and told us all about his life. In the early 1990s he was part of the musical act Calypso Twins with schoolfriend Paul Boross and released a hit record in the early 1990s, “World Party”. We were treated to various renditions of calypso music throughout the show which accompanied his dishes. The chilli cornbread muffins were prepared as a side to Peppy’s Ackee And Salt Fish In De Pan which brought with it stories of his mum. The Chargrilled Jerk-Slashed Chicken brought up opportunities for banter with the audience and he even promised some food to a woman a few seats in front of me. 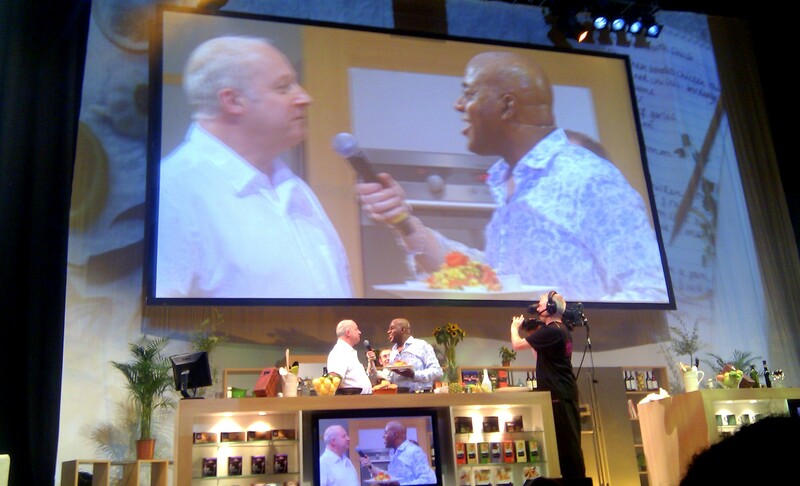 Ainsley stepped out into the crowd, joyfully hugged a woman celebrating her birthday, interviewed the catering college students from the City of Bristol College who helped out with the preparations, and brought to the stage an audience member tasked with tasting the wine and the food. He put on a show and I would pay to see him again but I must confess it was Rachel’s duck dish for which I passed by a supermarket and bought the ingredients. The Love Cooking Festival in Bristol was a great example of how not all festivals are alike and there was not a Pieminister pie in sight. 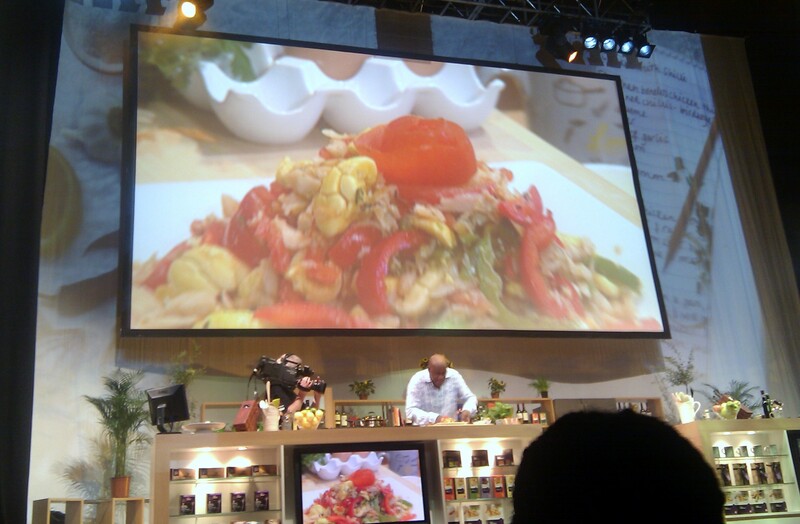 Love Cooking Festival sessions: London, 2 November. Harrogate, 5 December. Tickets are still available. This entry was posted in Bristol Photography, Food, Uncategorized and tagged cooking, festival, Food, Love Cooking Festival. Bookmark the permalink. …and there was not a Pieminister pie in sight. Those parvenu pastry creations had probably all been seen off by their Clark’s counterparts, whose pastry could be used to replace body armour. Great comment! I hadn’t heard of the Clark Pies, for a moment I wondered whether they were a reference to Pratchett’s mention of pies sold in Ankh Morpork. Sound similar. Thanks for the tidbits of information, I love them.